Scott Ethan Allen was born February 8, 1949 in Newark and grew up in Kinnelon. He is a descendant of Revolutionary War hero Ethan Allen and the son of Frank Allen and Sonja Fuhrman. His mother was a national champion figure skater from Sweden. Scott was on skates almost as soon as he could walk and skating competitively at age 6. By the age of 9, Scott was good enough to skate in the Novice division of the U.S. Championships. He was by far the youngest skater in the history of the competition. He stunned the sport by winning a silver medal. Scott trained with coach Fritz Dietl and competed for the Skating Club of New York. It was one of the nation’s oldest and best. Olympic gold medalist Carol Heiss skated for the club, as did Dorothy Hamill and Sarah Hughes many years later. 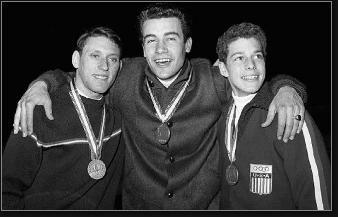 Scott moved up to the Junior division in in 1961 at age 12 and won another silver medal at the Nationals. That year, the entire U.S. skating team was wiped out when its plane crashed on the way to the World Championships. Scott and his coach had planned to be on that flight, but Dietl cancelled their tickets because he had to repair a broken compressor at a rink he managed. This tragedy opened the door to America’s promising juniors, including Scott, who won a silver medal at the 1962 nationals at age 13. Scott repeated his second-place finish in 1963 and won gold at the U.S. Nationals in 1964. That earned him the top slot on the U.S. Olympic team. 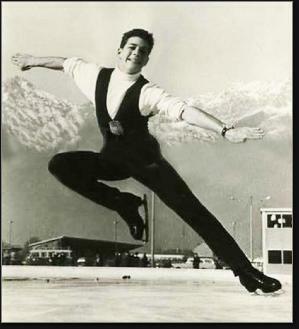 At the 1964 Winter Games in Innsbruck, Scott skated to a bronze medal with a powerful performance in the free skate portion of the men’s finals. He was so relaxed that he actually waved to his friends in the stands during his routine. He was two days short of his 15th birthday, making him the youngest Olympic medalist in men’s figure skating history. Upon his return, he was honored with Scott Allen Day in Kinnelon. Scott went on to win silver at the 1965 World Championships in Colorado and gold at the 1966 Nationals. His main U.S. rival was Gary Visconti. Against international competition in the late 1960s, Scott was usually in the hunt but never considered one of the world’s best skaters. His vitality and showmanship, however, usually earned him recognition from the judges. A bright and accomplished student at Kinnelon High, Scott opted to attend Harvard University rather than focusing on his skating career. That cost him a spot on the 1968 Olympic team, as he was edged for the final slot by another teenager, John Petkevich. After graduating in 1971, Scott earned an MBA from Columbia and then went to work for the Corbin clothing company. The owner, Howard Corbin, had married Scott’s mother after Frank Allen passed away. Prior to the 1996 Olympics, Scott was selected to be one of the torch carriers.